How many people have actually heard of broccoli rabe? Rapini? Those are the two names this green most commonly goes by in the United States, and usually it’s sauteed and served as a side dish at restaurants. Despite the name, it has absolutely no connection to broccoli, but it does have little florets that look very similar to broccoli interspersed among the leaves. It is actually most closely related to turnips! My guess is that it’s similar to turnip greens, but I’ve never had them so I can’t say for sure. I do know that it is quite tasty and is one of the few vegetables that I really enjoy. It wilts down nicely when sauteed with garlic, and is even tastier when thrown in with pasta and sausage! 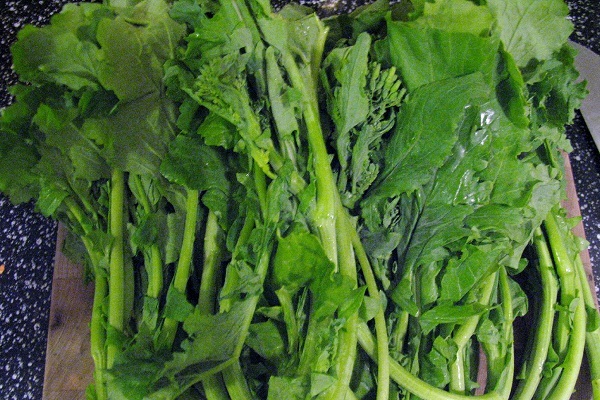 Broccoli rabe might be difficult to find, but if you happen to come across it, it is definitely worth trying. It’s typically found with all the other greens, like kale, collard greens, and mustard greens. If you can’t find it but still want to try this delicious and simple dish, just use broccolini. 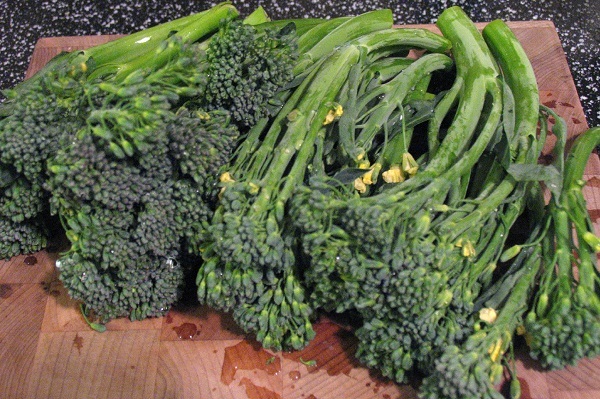 Broccolini is related to broccoli, and similar in taste, but has long stalks and small broccoli florets. This dish is light, with only an olive oil and garlic sauce coating the pasta, and it has a perfect ration of sausage to greens. And if you’re anything like me, it’s a great way to add some green to your diet! Bring a large pot of salted water to a boil. Cook the orecchiette until tender but still firm, stirring occasionally, about 8 minutes. 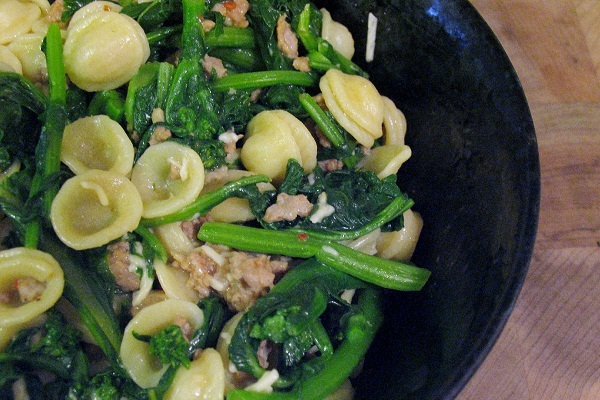 One minute before the pasta is done cooking, add the broccoli rabe to the pot, stirring until crisp-tender. If using broccolini, add it to the pot 3 minutes before the pasta is done cooking. Drain, reserving 1 cup of cooking liquid. Meanwhile, in a large skillet over medium heat, heat the olive oil. Add the sausage and cook, breaking up with a spoon, until the sausage is brown and juices form, about 8 minutes. Add the garlic and red pepper flakes, and saute until fragrant, about 30 seconds. Add the broccoli rabe and pasta, and toss to coat; add enough reserved cooking liquid to moisten, adding ¼ cup at a time as needed. Stir in the Parmesan cheese and ground pepper, adding salt to season as needed. Transfer to bowls and serve.